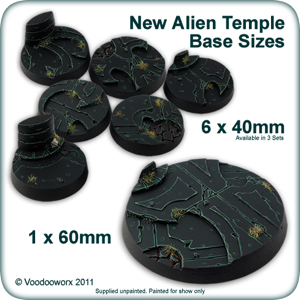 I'm pleased to announce that we have just added six new 40mm and one 60mm gaming base to our site, for our 'Alien Temple' theme. The new 40mm sets start at just £2.00 each and our new 60mm base is only £3.00. We have also released the first of our 'Battlegroup Bundles' this month. You get 28 bases in total: 20 x 25mm, 6 x 40mm, and 2 x 60mm bases for the great price of £21.60. That's a 10% saving, making it even cheaper to base your army! Voodooworx now has a Facebook page and it would be great to see you all on there. Once we have a healthy amount of members we plan to start holding free prize draws. All you have to do to enter is 'like' the page. We will keep everyone updated on there as to when we plan to start them and what we will be giving away.